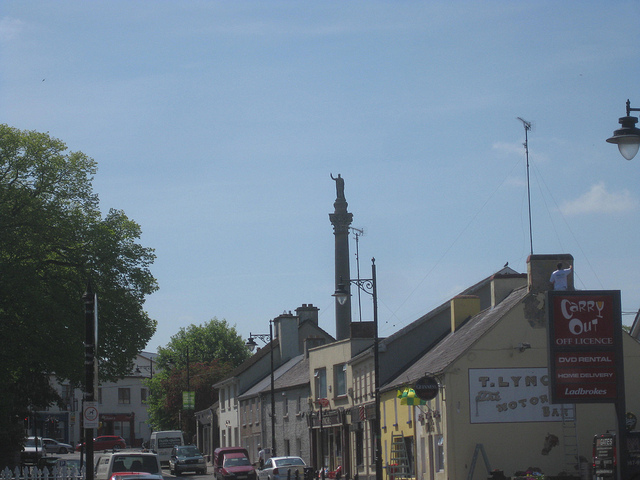 What is an age-worn statue of the Duke of Wellington doing atop a pillar in the small town of Trim, in the County Meath countryside? View of Trim with the statue of Wellington keeping watch. The locals shrug and smile and politely inform the irate visitor that actually, the Duke of Wellington was really an Irish aristocrat: born in Dublin and educated in Trim, he defeated Napoleon at Waterloo and rose to the very pinnacle of British politics, serving as Prime Minister twice. Clearly, he came from an aristocratic Anglo-Irish lineage, but being Irish-born was never an obstacle to well-born young men. He may have been Protestant, but that didn’t stop him championing Catholic emancipation by pushing the Catholic Relief Act of 1829 through a deeply divided Parliament. He even fought a duel with one of his main critics after the bill became law. It’s thought that his religiously tolerant views were informed by his early education and life in Trim. Before he embarked on his storied military career, the future Duke was elected as MP for Trim twice — although this does not reflect any great popular support or appeal: the constituency was a “rotten” borough, as only a handful of Protestant landowners were allowed to vote. 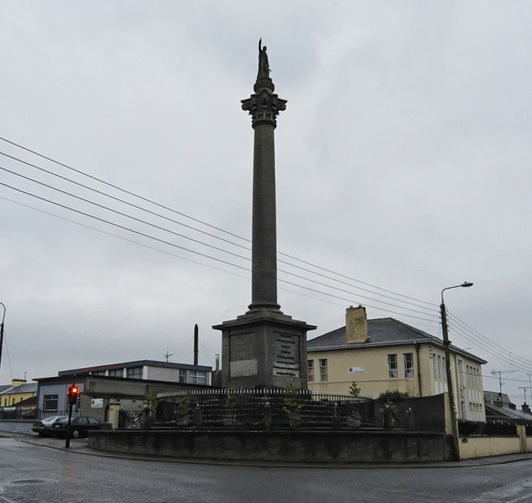 The column in Trim was erected in 1817, two years after his famous victory over Napoleon. The statue depicts the Duke in military uniform, with one arm raised in blessing or triumph. Local tradition holds that Wellington originally brandished a sword in his upraised hand, but some patriot took offense at this during the War of Independence and shot it away. I have not found any documentary evidence supporting this claim, but it sounds plausible — and, since when did we Irish ever let a lack of facts prevent us repeating a good story? Dublin (the city of the Wellesley’s birth) also erected an impressive monument to their famous son, this time a massive obelisk (actually, at 205ft tall, the largest in Europe — in case you’re a trivia buff) in the Phoenix Park. But that one is just another strange monument in a park filled with many. Wellington on his pillar is a very grand monument for a small town such as Trim, and the locals retain a soft spot for this famous son. He apparantly once made the cryptic comment, when asked if he was really Irish, that being born in a stable didn’t make one a horse, and the forces of righteous indignation regularly seize upon it as a slight against the Irish, and a justification to topple him off his 75-foot pedestal. However, it could reasonably have been an attempt at a mildly blasphemous joke, and the Duke of Wellington was so larger-than-life that many apocrypal quotations have been attributed to him. In fact, “his” most-famous quote, that the Battle of Waterloo was won on the playing fields of Eton, seems very likely to be completely false, as not only did he hate Eton while he was a student there, but there were no playing fields at Eton in his time. Regardless of this argument, in a town like Trim which is overflowing with history (including the largest Norman castle in the country, a claimant to the title of first church in Ireland, the much-photographed Yellow Steeple, the ruins of Newtown Trim Abbey, an alledgedly haunted friary, a magnificent Cathedral, the beautiful river Boyne itself, and possibly a hoard of hidden gold waiting to be rediscovered…) the apparant oddity of a statue of the Duke of Wellington is just one more tourist attraction among many, and not the most prominent one at that. But for me, its semi-obscurity only serves to highlight its interest and underlines the complex history of Ireland. For a man from such a quiet town to end up holding the top job in the British political world not once but twice, via winning one of the biggest battles in history, is an extraordinary life, and a great example of the rich stories to be found behind unassuming monuments all over the country.